This Thursday’s crucial Euro 2016 qualifier will be Ireland’s 22nd meeting with Germany. Ireland have won six of those games, drawn five and lost ten. Notwithstanding the obvious differences in playing resources, Ireland and Germany have provided each other with regular opposition in what constituted a close footballing relationship for much of the 20th Century. We take a look back at the history of the fixture. 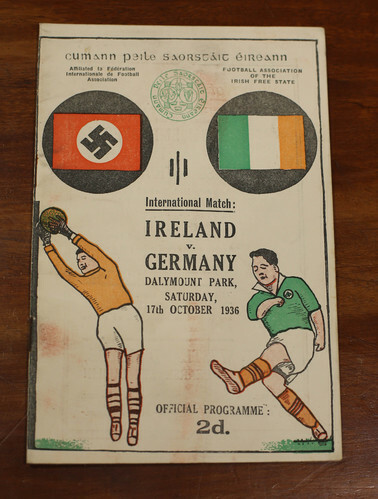 The first fixture between Ireland and Germany took place in Dortmund on 8th May 1935. Ireland took the lead through a 19th minute goal from Plev Ellis. However, Germany equalised before half-time and the home side finished with a comfortable 3-1 win. The following year the sides met again at Dalymount Park in front of an attendance of over 30,000. Two goals from Joey Donnelly helped Ireland to a 5-2 victory. The third meeting took place in Bremen in May 1939, only months before the outbreak of the Second World War. After a first half goal from Helmut Schon, a second half equaliser from Paddy Bradshaw secured a 1-1 draw for Ireland. It would be over twelve years before Ireland would once again meet the Germans and they now played under the name of West Germany. The fixture took place at Dalymount Park in October 1951 and was tied 2-2 with five minutes to go when Dessie Glynn of Drumcondra FC popped up to score the winner for Ireland. Ireland played West Germany away in 1952 and 1955, with the Germans winning both games. They met again in November 1956 with West Germany once again visiting Dalymount Park as the reigning world champions following their World Cup success two years previously. In what must be considered as one of Ireland’s greatest ever results, the Boys in Green defeated the world champions with a convincing 3-0 score line. The three goals arrived in the second half via Noel Cantwell, Joe Haverty and Jimmy McCann. 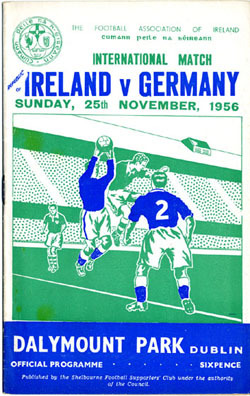 Ireland continued their impressive form against the Germans in Dusseldorf in 1960 when they secured their first away win in the sequence of fixtures. 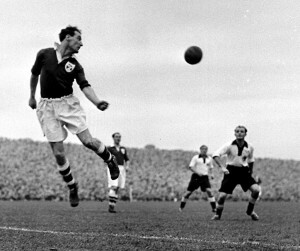 A first half goal from Derby County’s Paddy Fagan was sufficient to earn the Boys in Green a victory in front of a crowd of 51,000 in the Rheinstadion. The result would be very different when the sides met six years later in Dalymount Park. It was in the weeks prior to the 1966 World Cup Finals and West Germany were now managed by Helmut Schon who had scored when the teams played in 1939. The Germans also had a young Franz Beckenbauer in their side and he scored the second goal in a comfortable 4-nil win for the Germans. West Germany would ultimately reach the 1966 World Cup Final, which perhaps illustrated the huge gap between the footballing exploits of the respective countries despite Ireland holding their own each time they met. Four years later, Ireland once again provided the opposition for West Germany as they prepared for the 1970 World Cup Finals. The match took place in the Olympiastadion in Berlin in front of an attendance of over 70,000. The West Germans included Beckenbauer, Gerd Muller and Uwe Seeler in what was a formidable team. Ireland had a reasonable team themselves, with Alan Kelly in goals, Johnny Giles in midfield and Don Givens up front. However West Germany won 2-1 with the Irish goal coming from Paddy Mulligan. In March 1975, the teams would once again meet in what was to be the fifth and final occasion that the fixture took place in Dalymount Park. Ireland were managed by Johnny Giles and included a nice blend of youth and experience, with the flair of Liam Brady and Steve Heighway in midfield. On the other hand, Germany had a young team on display, which was a shadow of the side that had won their second World Cup on home soil the previous year. It was therefore unsurprising that Ireland won 1-0 with an 89th goal from substitute Jimmy Conway. 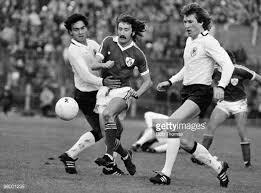 In the subsequent fixtures, Ireland went on to suffer a 1-3 defeat at Lansdowne Road in May 1979 and a further 3-0 defeat in Bremen in May 1981. 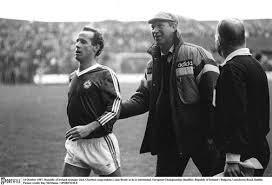 By the time Jack Charlton took over the management of the Irish team in 1986, the regular fixtures with West Germany had become less frequent. 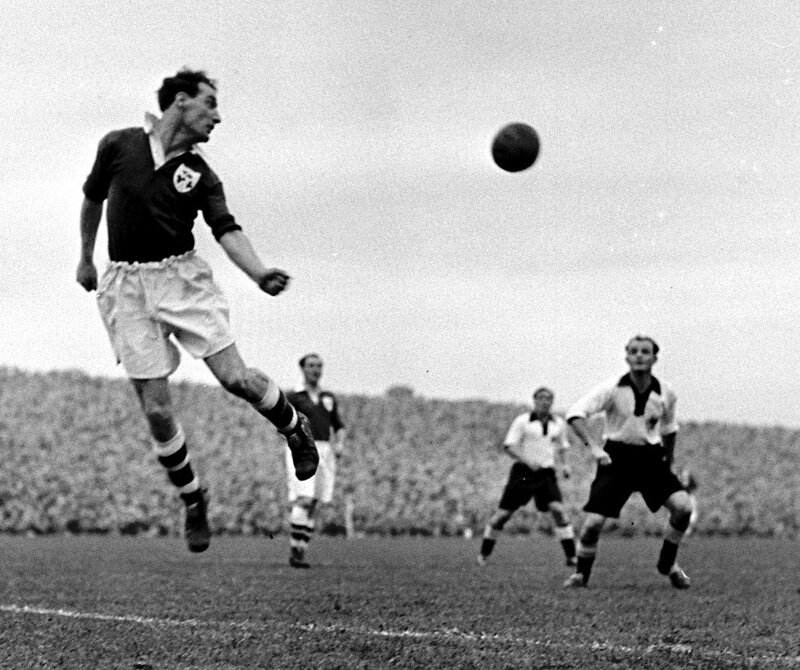 Nonetheless, Ireland faced their German counterparts in two separate friendlies during Charlton’s tenure, with both fixtures remembered for different reasons. Look, if Jack wanted me out of the way, and if he stage-managed the situation by subbing me against West Germany, then it was diabolical. But that’s in the past, and anyway, it’s important to remember that I played some of my best football for Ireland under Jack. I admired him as a manager, he was decisive, he had a plan, he could handle pressure. The 1989 fixture ended in a 1-1 score line and both countries would go on to have a memorable World Cup the following summer. Jack Charlton led Ireland on an incredible journey to the quarter-finals of Italia ’90, whilst Franz Beckenauer managed the Germans to their third World Cup success. Indeed, the teams were fortunate not to have met each other in the second round of the competition when Ireland and Holland’s identical records in their group meant that they were forced to draw lots to determine which side would meet the Germans and which would meet Romania. The rest is history! The second fixture of the Charlton era was in May 1994, two weeks prior to Ireland’s second appearance at the World Cup Finals. 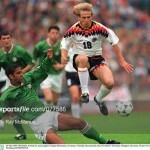 It was a friendly in Hannover against a full-strength German side, which was managed by Berti Vogts. Ireland took a well-deserved lead on the half hour mark through a goal from Tony Cascarino. It was a surprising score line against the reigning world champions with an Irish team that included the youngsters Phil Babb and Jason McAteer. However, it was to be the third of ‘the Three Amigos’ that would steal the headlines when Gary Kelly was introduced as a second-half substitute and sealed the win. It is remarkable that after playing each other in a total of fifteen friendly internationals Ireland’s first competitive fixture against Germany was at the World Cup Finals in 2002. The build-up to the tournament was dominated by Saipan and following a spirited draw with Cameroon Ireland were under pressure to get a result. Germany took the lead in the 19th minute when Miroslav Klose headed past Shay Given. However, Ireland slowly worked their way back into the game and created some good opportunities. Both Matt Holland and Damien Duff went close but Oliver Kahn’s goal remained intact. As the match entered the second minute of injury time Steve Finnan sent a long ball forward to Niall Quinn who headed the ball into the path of the onrushing Robbie Keane. Somehow Keane was able to wrap his right foot around the ball and his strike flew past Kahn at the near post. It was a well-deserved draw for Ireland and helped them progress to the last 16 of the World Cup. Germany would go on to the World Cup Final where two goals from Brazil’s Ronaldo would deny them the trophy. The World Cup 2002 fixture was particularly memorable for Steve Staunton as he became the first Irish player to win 100 caps. Four years later, Staunton was managing Ireland when they started their European Championship qualifying campaign away to Germany in what was also Joachim Low’s first competitive fixture in charge of the Germans. The match was played in Stuttgart and Germany dominated proceedings. However, Ireland put in a resolute defensive performance and it took a deflected shot from Lucas Podolski in the 57th minute to open the scoring. The match finished on a 1-0 score line and Staunton’s frustration was in evidence as he was sent-off for kicking a water bottle and given a subsequent touchline ban. The return fixture was played in Croke Park in October 2007. Requiring just a point to qualify, Germany seemed happy to settle for a draw. Andy Reid played in midfield and put in a man-of-the-match performance in what was arguably his best display in an Ireland jersey. The match finished in a scoreless draw with Staunton’s managerial tenure coming to an end the following week. Ireland and Germany were once again drawn in the same qualifying group for the 2014 World Cup. After a hugely disappointing appearance at Euro 2012, Giovanni Trapattoni’s team faced Germany at home in October 2012. 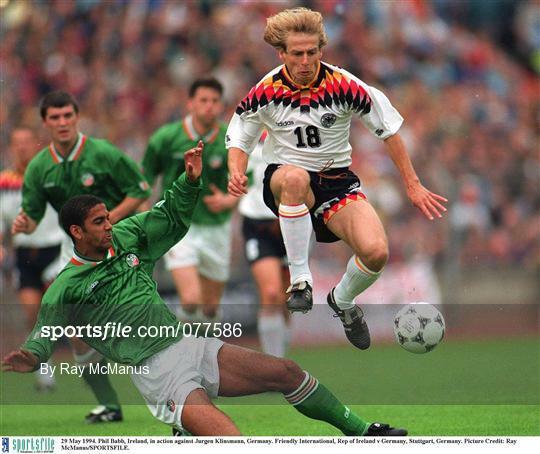 It proved to be one of the darkest days in Irish football history, as a slick German team tore Ireland to shreds. Marco Reus and Toni Kroos both scored a brace as Germany netted six times. 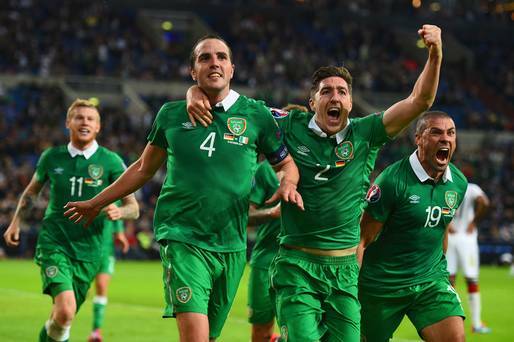 A late goal from Andy Keogh was of little consolation as the Irish team were truly humbled on their home patch. It was clear that Trapattoni’s days as Ireland manager were numbered and by the time the two countries met the following year, the Italian was gone and Ireland were out of contention for qualification. Noel King took up the reigns as caretaker manager. The match was played in Cologne and Germany eased their way to a comfortable 3-0 victory courtesy of goals from Sami Khedira, Andre Schurrle and Mesut Özil. Only a heroic goalkeeping performance from David Forde saved Ireland from further humiliation. This brings us to the current European Championship qualifying campaign and the most recent meeting between Germany and Ireland. The match took place in Gelsenkirchen on 14th October 2014. Ireland defended stoutly for most of the game but Germany took a deserved lead when Toni Kroos scored after 71 minutes. However, like lbaraki twelve years previously, Ireland would have the final say. John O’Shea who had taken over the captain’s armband from Robbie Keane, popped up in the fourth minute of injury-time to score a priceless equaliser. Indeed, O’Shea’s goal provided a certain symmetry with that memorable World Cup fixture from 2002; not only did O’Shea emulate Robbie Keane with his injury-time equaliser, but he also followed in the footsteps of Steve Staunton by winning his 100th cap against Germany. As Ireland approach this Thursday night’s penultimate qualifying game in Dublin Irish fans might take heart from what has been a relatively successful history against German teams. Whilst Germany lead the way in the 21 fixtures to date, Ireland have consistently punched above their weight and picked up some impressive results. Ireland have scored a total of 24 goals in the history of the fixture, with six of those goals arriving in the final five minutes of games. Irish fans will be hoping that the same spirit and never-say-die attitude is present in the Irish team that takes to the field on Thursday night.